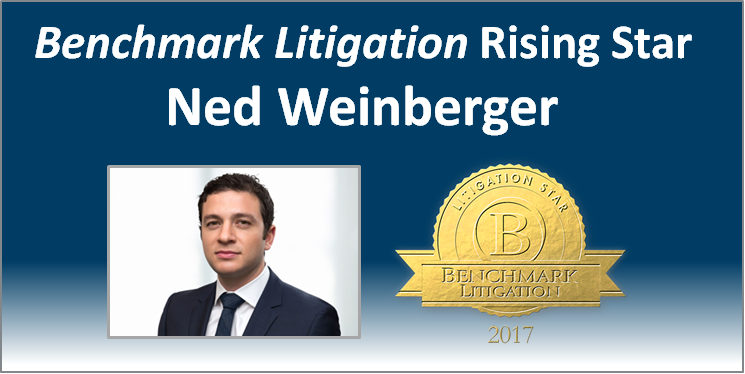 NEW YORK (August 1, 2017) – Labaton Sucharow LLP is pleased to announce that Firm partner Ned Weinberger has been named to Benchmark Litigation’s Rising Stars list, which honors attorneys under 40 at the partner level with a track record of accomplishments. Selected based on Benchmark research, as well as peer and client review, Weinberger focuses on representing investors in corporate governance and transactional matters, including class action and derivative litigation. Weinberger, Chair of the Firm’s Corporate Governance and Shareholder Rights Litigation Practice, is currently prosecuting, among other matters, In re Straight Path Communications Inc. Consolidated Stockholder Litigation, which alleges breaches of fiduciary duty by the controlling stockholder of Straight Path Communications, Howard Jonas, in connection with the company’s proposed sale to Verizon Communications Inc. Weinberger also leads a class and derivative action on behalf of stockholders of Providence Service Corporation—Haverhill Retirement System v. Kerley—that challenges an acquisition financing arrangement involving Providence’s board chairman and his hedge fund. The case recently settled for $10 million, and is currently pending court approval. Weinberger was part of a team that achieved a $12 million recovery on behalf of stockholders of ArthroCare Corporation in a case alleging breaches of fiduciary duty by the ArthroCare board of directors and other defendants in connection with Smith & Nephew, Inc.’s acquisition of ArthroCare. Other recent successes on behalf of stockholders include In re Vaalco Energy Inc. Consolidated Stockholder Litigation, which resulted in the invalidation of charter and bylaw provisions that interfered with stockholders’ fundamental right to remove directors without cause. Weinberger was also recently recognized by Chambers & Partners USA in the Delaware Court of Chancery and was named “Up and Coming,” noting his impressive range of practice areas. He was also named a “Leading Lawyer” by The Legal 500. Benchmark Litigation is a leading guide to America’s top litigation firms and attorneys and the only publication to focus exclusively on U.S. litigation. For more information, visit benchmarklitigation.com.